Starting an Organization: What Are Factoring Services? As 2019 is officially underway, it’s time for entrepreneurs to start making moves toward running successful businesses of their own. Hopefully, you have already developed a strong business plan, have purchased a building to run your business out of, and got a few hardworking and trusted employees on board. The next step, however, is perhaps the most crucial: securing enough financing. Thankfully, there are accounts receivable financing companies that can provide you and your business with enough working capital to actually get your business off the ground. Hopefully, this information will help you better understand what are factoring services and why they are so important for a brand-new business. Invoice factoring is a type of accounts receivable financing that converts outstanding invoices due within 90 days into immediate cash for your business. An organization will sometimes factor its assets to meet its current cash needs, as opposed to struggling and, frankly, running out of money. A startup could have the best business plan in the world, with plenty of sales leads and a strong customer base; but if there isn’t enough initial cash to get everything up and running, it will all come to a halt. 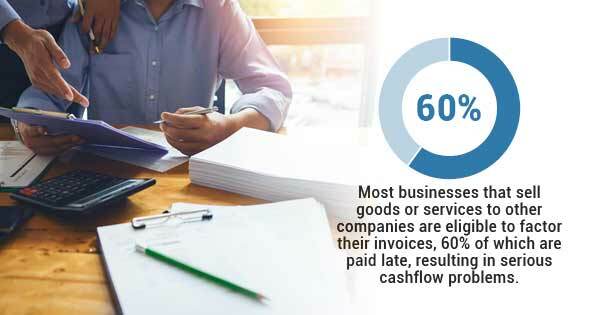 Most businesses that sell goods or services to other companies are eligible to factor their invoices, 60% of which are paid late, resulting in serious cashflow problems. Large corporations can typically handle waiting a month or two for cash payments, but smaller businesses — especially startups — require that money as soon as possible. Keep in mind, applicants for factoring services are evaluated creditworthiness, rather than credit score, so a short or negative credit history, which startup owners might possess, would not disqualify an applicant from receiving factoring services. The fee paid to the factor. The interest expense paid to the factor for the advance. The debt expense associated with a portion of the receivables. The additional amount to cover merchandise returns and additional losses. If you are still not sure what are factoring services and want to speak with trusted invoice factoring services in the United States, give Eagle Business Credit a call today and good luck on all your 2019 business ventures.